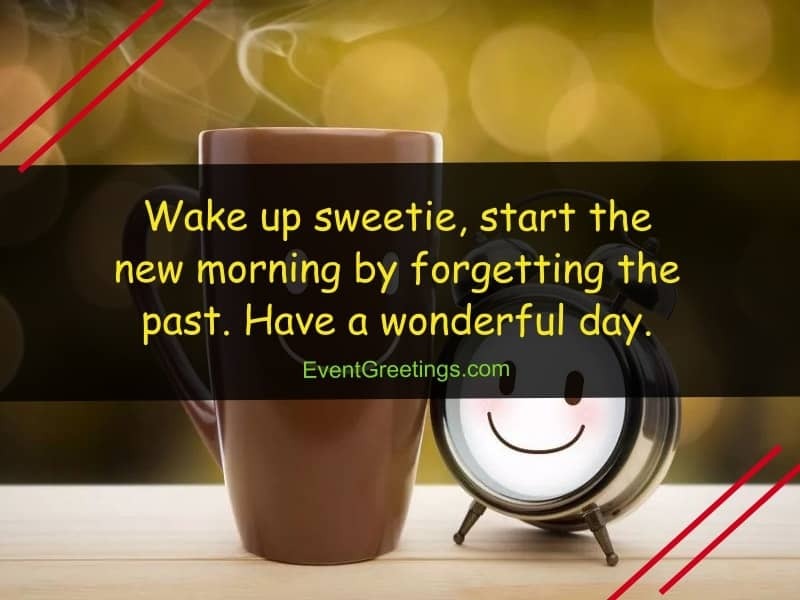 Good Day Quotes – Every day comes with all the way new hopes, new plans and new opportunities. We all get new challenges with every new day. Starting a day with a smile on the face and positive attitude towards all the people can surely make our day better. Good Day Messages are the kind words and wishes for the entire day to come. Some inspiration should be there sometimes to have a good day. You can read these Inspirational Good Day Messages to motivate yourself, or to have a happy and good day. 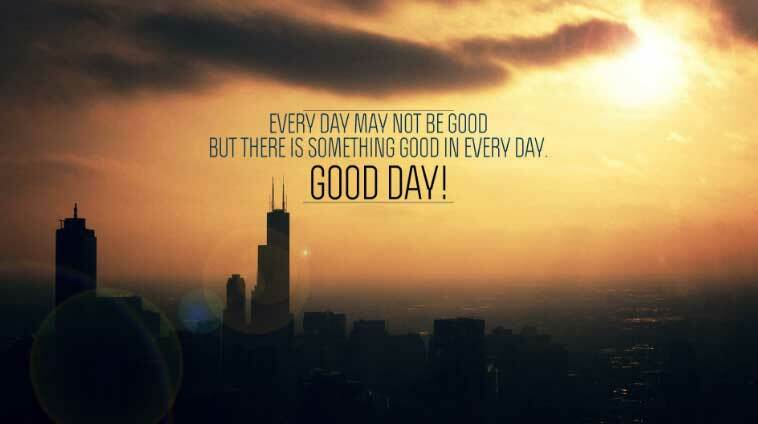 We have a compiled some of the best good day quotes for you. You can also use these messages to motivate your friends and to wish them a good day. Your love and care can be judged if you wish a have a wonderful day to a person. So wish a good day to your friends, your brothers and sisters or anyone you love. Have a great Friday !! Never regret in your life. Good things make you happy and the bad things give you experiences. Remember to thank God before and after every day, you’ll surely have all the best days. The sun is shining on the sky so brightly, your day is also going to shine the same way. Have a good day. 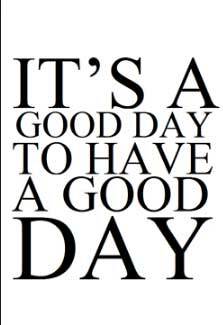 We can just make our day a good one or a bad one so easily, it’s our attitude that makes a day good or bad. So why not show a positive attitude and have a nice day. Blaming a day will not give you happiness. Be positive and learn lessons from the bad days in life because they are important too. Always wake up with positive thoughts and never think negative. This is the key to have the best day. Nightmares are good sometimes. Because it’s disappointing when you wake up from a dream but when you wake up during a nightmare, you get a relief that it’s all fine. Have a good day. There are hundreds and thousands of languages in this world but there is only one language that can beat all others, and that language is “SMILE”. This is the only language that even a baby can speak. So keep smiling and make others smile too. Have a nice day. I just wanted to disturb your sleep and say Good Morning. HA HA. Have a very nice day. 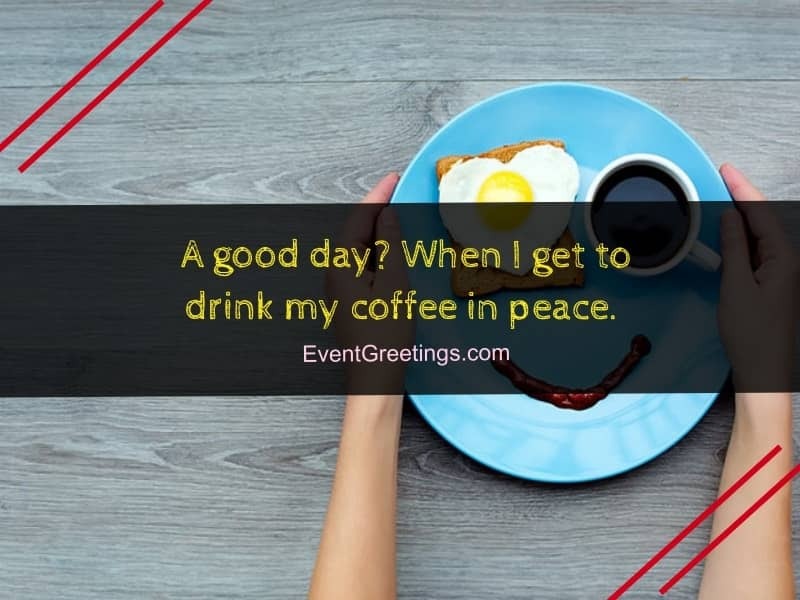 Your day may start or end without getting a good morning or good night message from me. But surely I think of you before starting and ending my day. Have a good day today and always. You will find your luck when you’ll stop searching for it by putting all your struggles and efforts into what you are going to achieve. So have faith in yourself and step ahead to achieve your goals. This is the basic problem in all people that we don’t love what we have and we don’t have what we love. Still we hope that we will get what we love. All I have to say is that be positive and love what you have. Have a very good day. Living in good and bad situations is the part of life, but surviving in all the situations will smile on your face is the real art of life. Have a good day. Keep smiling. Morning sun is rising and I will you a good day ahead. 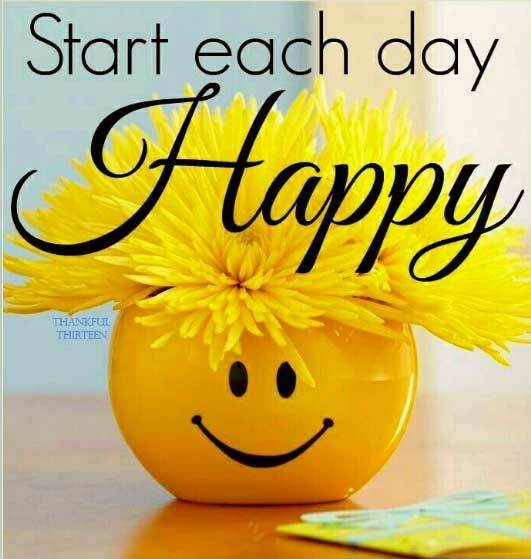 Welcome every day with a smile on your face. I wish you all the best for your life. Keep smiling because this is the key to have a happy life. May you have a very good day. Start it with all the energy you have. Have a fabulous day..
Wake up because another good day is waiting for you. Welcome it with a smile. I always pray for you. Everything you pray for will be yours and your dreams will surely come true someday. It may not be exactly what you wanted. But it will be best for you undoubtedly because God has better plans for you. He will always bless a person with his best. Have faith in God and begin your every day with positive thoughts. Your day will be good automatically. Have a good day ahead. Love yourself for a peaceful and happy life. Dream big and put all your efforts to make it come true. Put your ego on the side and step ahead to make your life better then you will surely be happy for your entire life. Have a very nice day. May your all days be blessed with the best. A single person who is there with you in your bad times is better than the hundred people who celebrate your success. I wish you a colorful and beautiful life. May you get all the things you have ever wishes for. Have a nice day. Love your life and keep smiling. Have confidence that you can achieve your desires by your efforts. Have a very good day ahead. A new day is here. Start it with all new hopes because with every new day there are new opportunities. Go ahead and avail the opportunities and get the success. May you have a happy day. 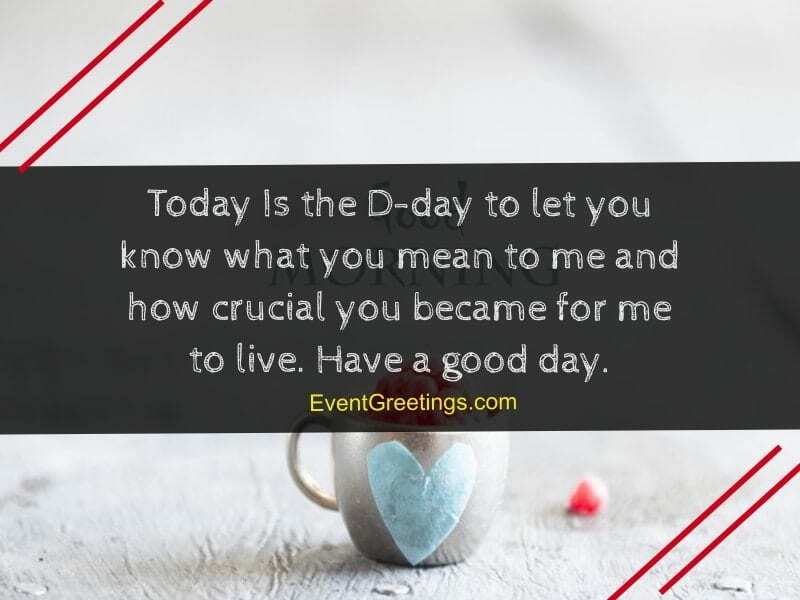 The below beautiful ‘Have a good day’ quotes will definitely put a smile on the receiver’s face. Think less, do more! Keep your faith and trust the Universe that today will be a great day! Have a cup of warm tea and get ready to take on the world! Trust yourself to succeed and make the most of your day ahead! Opportunities lurk on every corner! Have a great day ahead and keep in mind that anything is possible if you trust yourself enough to do it! Be spontaneous, be daring and get things done! Have a wonderful day and direct your energy towards things which matter to you the most! Use your positive vibes to seize the day ahead! Smile and welcome any challenge with open arms! The Universe only gives you as much as you are able to handle! Have a successful day ahead and know that everything always works out in the end! Don’t let your dream day slip through your fingers! Pack yourself with positivity and let it reflect on your day ahead! Have a blast and enjoy this day as if it were your last! You’d be surprised to learn what the universe has in store for you! A day well spent is not a wasted day, so get moving, make things happen and give your troubles a run for their money! You got this! When it seems the world conspires against you, be daring enough to revolutionize your day and prove to yourself you are capable, inspiring and worth it! This is your day – make the most of it! Discover what inspires you and let it make its way into your day! Have faith that you can do it and never be afraid to bring something a bit extraordinary to this day! Make this day the best one yet and go with the flow! What seems harder to do is oftentimes more rewarding, so be bold enough to take on this challenge today! Begin and end this day by having fun, and know that each obstacle makes you stronger and more willing to live the life you want! Even if you did everything wrong thus far, you will always have today to make things right one more! Have a great day and be unafraid to start all over again! Today, all you will need is a good head on your shoulders, a smile on your face and just a hint of optimism, telling you it’s all going to work out in the end! What is a good day, but the share of a smile and hope for tomorrow? May this be a good day and may you always follow your heart. Any day spent without me becoming annoyed is a good day! Wake up. Love yourself. This will be a good day. You can live each day once. Make it a good one. Have a day as good as the warm, spring breeze! The smell of coffee lets me know this will be a good day. 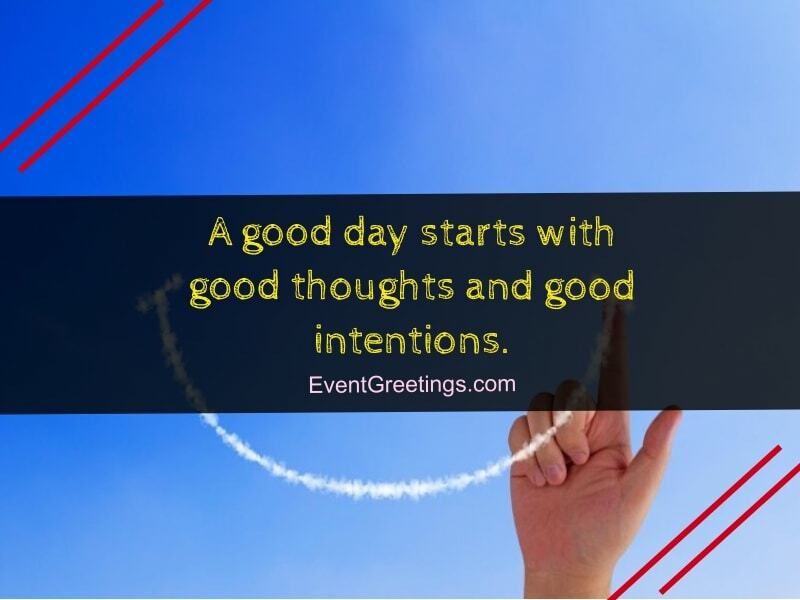 A good day starts with good thoughts and good intentions. We fought and argued, but I can still recall that one good day we had. 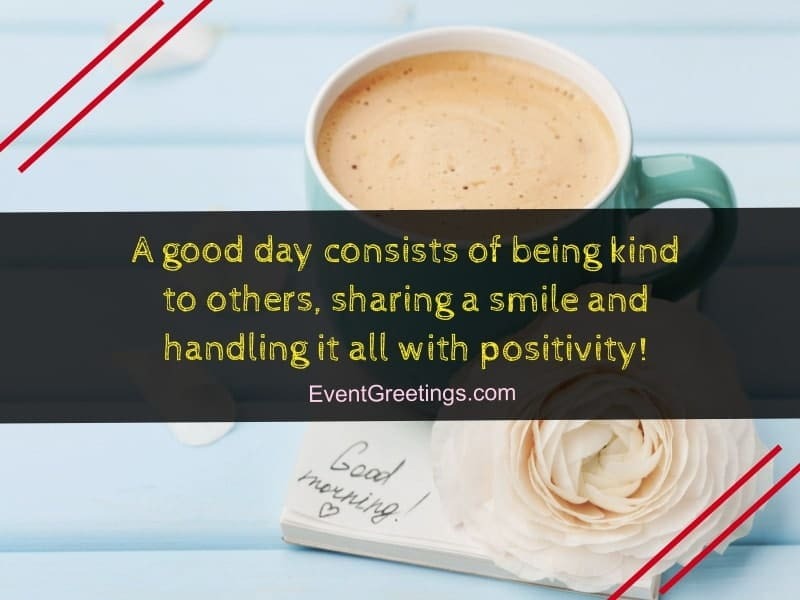 A good day consists of being kind to others, sharing a smile and handling it all with positivity! There will be days when others win, but let today be a good day. Whenever I hear ‘Have a good day!’ I get stress. I mean, think of the responsibility ahead. 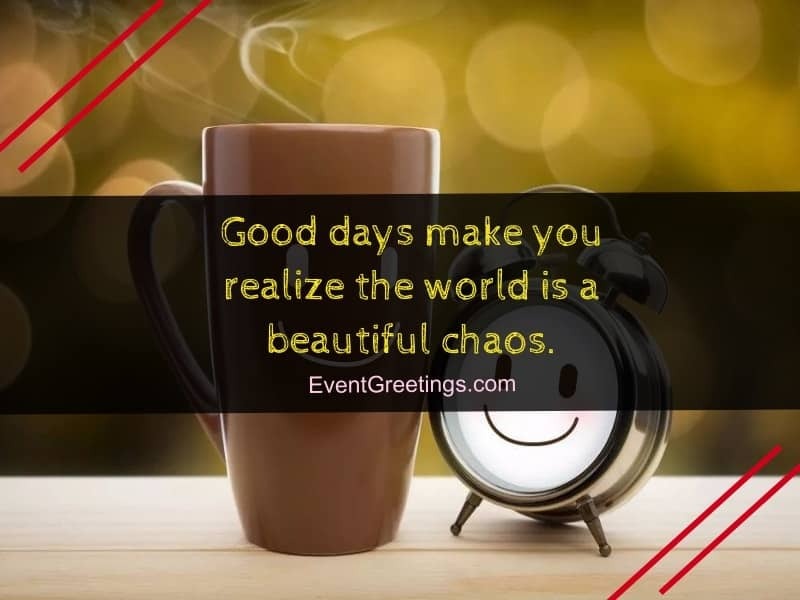 Good days make you realize the world is a beautiful chaos. A good day? When I get to drink my coffee in peace. Grab the opportunity to make today better than yesterday. Good Morning. I hope you woke up well & I can’t wait to see you. Just by remembering you my days get better. Have a great day yourself. Want to know how much I love you? Then hurry & wake up! Your Smile brings me happiness & I just want to say I love you so much. Good morning my love. 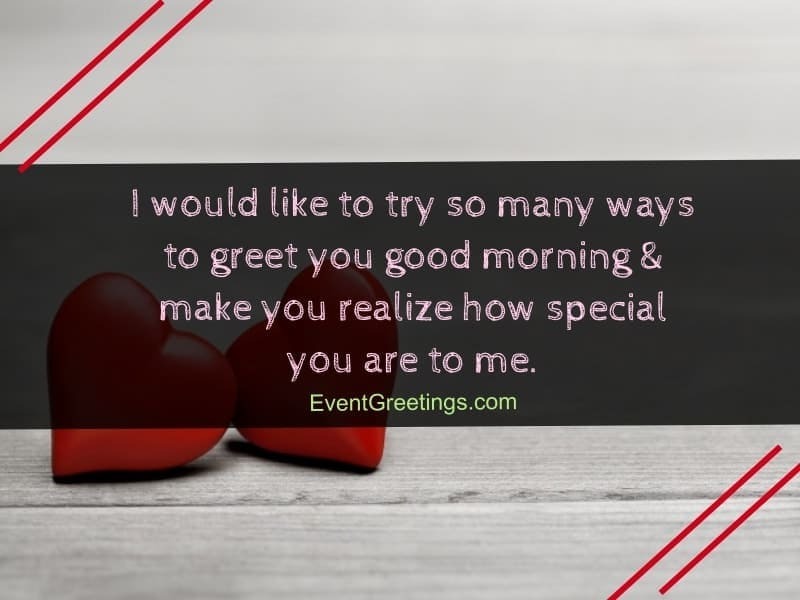 I would like to try so many ways to greet you good morning & make you realize how special you are to me. My day became great just by seeing you & hearing your sweet voice in the morning & I wish you a good day ahead. I love to wake up beside you in the morning, you make everything so special. Good morning Baby! Two Things I want to tell you every morning are, Good morning & I love you. I want to confess how you make my heart flutter and this thing only motivates me to go on life! Two things I want to tell you every day is I love you & have a nice day. Today Is the D-day to let you know what you mean to me and how crucial you became for me to live. Have a good day. You are the only reason I believe in love and thanks for reminding me every day. Have a Great day. Today I got up with a determination to tell you how much I love you & how you mean everything for me in this world. Good Morning. Good Day. I just want to let you know I like you & I would do everything for you to be happy. Every day waking beside you makes my day complete. Have great day my love. My mornings become great by sharing the first moments of the day with you. Good morning my dear & thanks for making every single moment so blissful with your presence. Good morning my love. Every morning when I found you beside me, I feel that there is no bad day in my life. Darling, have a great day remembering me. I will be thinking about you all the day. Love you. The beautiful thing about getting up is to see your face. I want to keep this habit until my death. Have a great day. Waking up by your side and thinking about the unforgettable time we have spent together is the best gift for me on every anniversary. Good morning my love. In this special day, I want to thank you for coming into my life and for making me the person I am today. Thanks for knowing me that I have the best life partner. I love you and congratulations for another year of togetherness.Have a great day. Wake up my heart. Hope that we will spend an unforgettable anniversary we never had before. On this day, we first met and started our new life. I want to wake up every day by your side. Every morning whenever I wake up and remember that, you are in my life, I feel really blessed. Have a great day darling. Good morning love. You make every days of mine special. Thanks for been there for me. Love you. I wish I had wings so that every morning, I could go to your house and wake you up. Good morning my sweetheart. I want to be your side and would like to wake up every morning with you, my princess with fairy tails. Good morning darling. I want to start my every morning thinking about you. Wake up sweetie, start the new morning by forgetting the past. Have a wonderful day.